Dreaming in SketchUp is a telltale sign. Trying to Push/Pull through physical walls is another. The symptoms of SketchUp addiction are many and varied, but one thing is certain: the only remedy is to attend 3D Basecamp, the world's premiere destination for all things SketchUp. Your obsession won't be cured, but you'll meet lots of other people just like you. Besides owning a holodeck, what could be better than that? 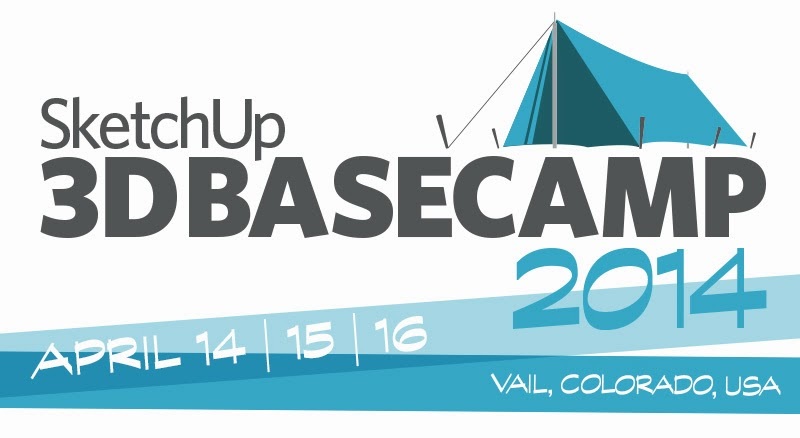 It gives me immense pleasure to announce SketchUp 3D Basecamp 2014. Our next shindig will take place from April 14th to the 16th in Vail, Colorado. We’ve booked an amazing venue in the heart of the Rocky Mountains—during ski season. We’ve made sure that there will be lots of meeting space, reliable internet, affordable lodging and terrific food. We’ve done what we’ve never done before: We’re announcing Basecamp six months ahead of time to give folks plenty of time to plan. This is going to be epic. We’ve put together an FAQ that should answer most of your burning questions. For the rest, please use the “More Questions?” widget at the bottom of the FAQ page; we’ll answer them as best we can. Update! 3D Basecamp registration is now open! Visit the website for more information, or go directly to the registration page to sign up. See you in Vail! Yay! I've been waiting for this since the 2012 Basecamp! Look forward to getting together again with everyone. Soo looking forward to going. Wish I could come! I live skiing - and SketchUp!